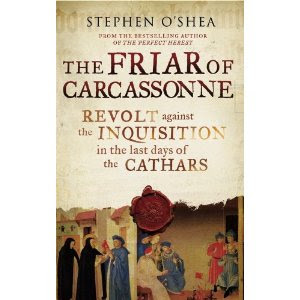 Following on from the review of The Friar of Caracassonne (review here), the author, Stephen O'Shea has kindly agree to answer a few questions about the book and (the usual) about himself. It contains both a recipe for snails and a spectacular molluscan feat. 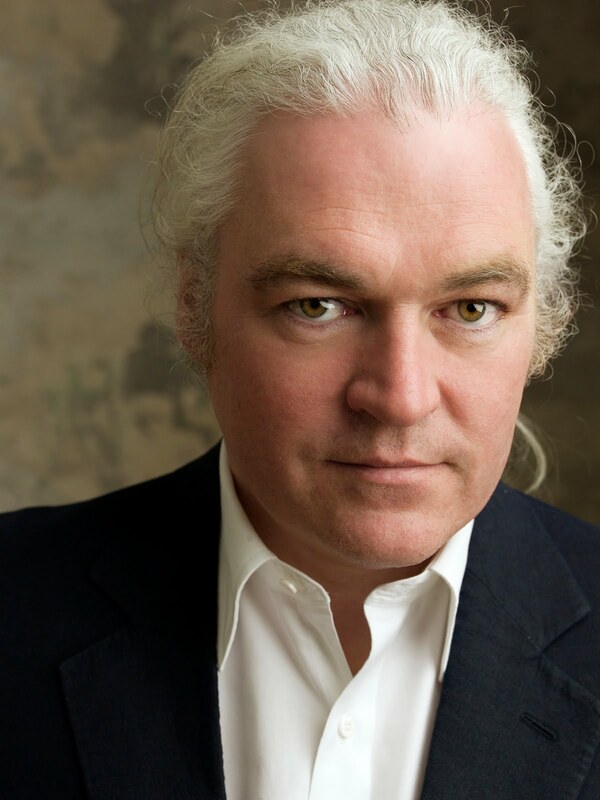 Stephen O’Shea is a Canadian writer and historian. His previous books on the history of the Middle Ages are this book’s bestselling predecessor The Perfect Heresy: The Life and Death of the Cathars and Sea of Faith: Islam and Christianity in the Medieval Mediterranean World. He was for many years a journalist in Paris and New York and contributed to a wide variety of publications on the arts and translated French feature films. O’Shea now lives in Providence, Rhode Island. Clare Dudman: What attracted you to the history of the Friar? Stephen O'Shea: I had come across Bernard's story, in fragmentary form, while researching The Perfect Heresy. 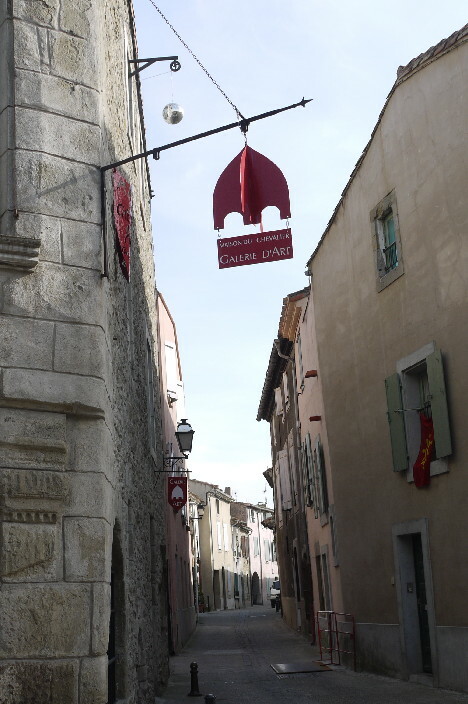 He's given a brief mention in that book... but his mysterious personal trajectory, his Roman candle appearance in history, always nagged at the back of my mind, even as I turned to other projects that had nothing to do with the Languedoc. One day a few years back, on a hunch, I sat down and carefully read the transcripts of his trial (they had only recently been translated from Latin into French). It was an a-ha moment. Not only was the story compelling and dramatic in and of itself, but it also echoed the current uneasiness I felt at the spectacle of what our societies had resumed doing... Once again, the resort to torture, the secret trials, the unlawful detention... Precisely the thing that Bernard fought against seven hundred years ago. Of course his starting point was entirely different from our opposition to such practices today, but the fight is timeless, universal even. Bernard had thought his Church had betrayed its founding principles, just as many of us think the same has been done to our hard-won commitment to due process and civil liberties. In short, an out-of-time enemy had been identified, and the rules rewritten to justify atrocious behavior. In Bernard's instance, his enemies, the Dominican inquisitors, reimagined their faith, as one founded on an imperative to persecute (!). I leave it to media dons and pundits to characterize how the present-day enthusiasts of summary justice and torture have reimagined their worldview. And, last, with Brother Bernard I had an amazing story, set in an epochal decade (first decade of the fourteenth), never before presented to the general reading public. So, to sum up: fascination with the man, his distant actions as a present-day parable, and the newness of the material. I knew I had to do it. CD: What do you think was his most important legacy? SOS: His name lives on locally in the Languedoc as a byword for resistance to overweening authority and religious zealotry. But, to be perfectly frank, his name is not a household word even down there, his contribution subsumed in the larger collective memory of the Cathars. I hope that works such as my own will contribute to broadening his legacy, getting out his story, making his actions part of the larger narrative we tell ourselves about the past. Statue of an unknown priest in the Carcassonne castle museum. CD: Is there a place in Languedoc-Rousillon you particularly recommend going to see - somewhere off the beaten track? SOS: I think climbing Mont Bugarach, the sacred mountain of the Occitans (not Montsegur, by the way), is a wonderful way to spend an afternoon. The ascent is easy, the mountain weird and mystical (geologicallly, it's basically a mountain that has fallen over on its side), the site steeped in folklore about sorcery, Catharism, and mythical creatures. From its summit, a majestic view of the Pyrenees, a commanding view of the Corbieres, a horizon of fascinating history and arresting beauty. If you're really adventurous, spend the night atop it and watch for shooting stars. Gate out of the old city to the new city (the Bourg). 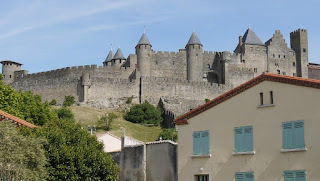 CD: Did the Cathars leave any legacy in France or elsewhere? I'm just wondering if there was any relationship between them and the religious non-conformist uprisings that came later. SOS: That's hard to say, accurately. Did they for example inspire the Protestant camisard revolt in the Lower Languedoc and the Cevennes? Probably not. What they did -- along with the crushing of Languedoc independence that occurred at the same time as their eradication -- was foster a spirit of truculence, a deep-seated anticlericalism in the people of southwestern France. That was then. 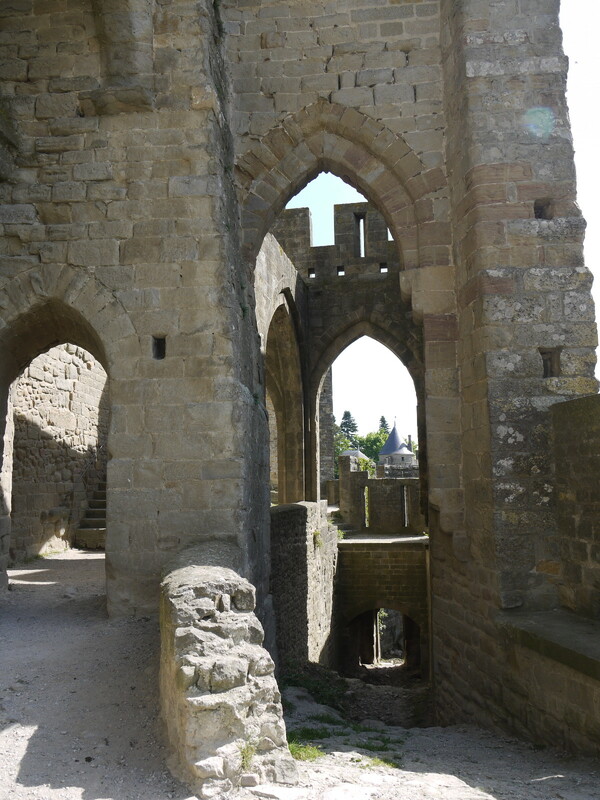 Now, or at least for the last 150 years, the story of the Cathars has been taken up and championed by various intellectual and cultural movements in the Languedoc, so that it is currently well-anchored in collective memory (The Cathars also, alas, have been relentlessly commercialized as of late by tourist boards and the like). If you're interested at all in this use and abuse of the Cathars from the 1850s to the present -- a thicket of weirdness and earnestness -- then I suggest you read the Epilogue of The Perfect Heresy, in which it is discussed. 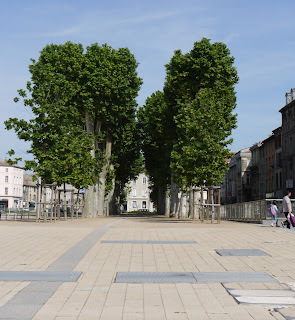 Square in the Bourg - maybe the site of the old Franciscan convent? CD: What was the most challenging part of your research? SOS: In truth, the research was not that difficult, not compared to my other books. It was a complicated story, but the source material (principally the amazing trial transcripts) laid out, in an albeit opaque fashion, the who's, why's and what's of the story. Where the challenge arose was in how, exactly, to present it. I could not just plop it, fully baked, into an unsuspecting reader's lap. How to contextualize it? What to tell of the larger European world at the time, and what to leave out. So Bernard was a formal challenge, a challenge to the writer rather than to the researcher. CD: Where did you have most fun? SOS: Going to the Languedoc, bombing around its vineyards and towns, the sites of Bernard's actions. Snapping pictures. And talking to locals -- including Dominicans and nuns -- about Bernard and the Inquisition. I love how you sometimes can talk about something that happened 700 years ago as if it happened just yesterday. Such is one of Languedoc's greatest charms, its voluble, warm, very opinionated people. CD: How does this book relate to its predecessor 'The Perfect Heresy'? SOS: While not a sequel, it should be considered a companion volume. TPH concentrated most on the rise of the Cathars, the Albigensian Crusade and the events leading to Montsegur -- the last half of the twelfth and the first half of the thirteenth centuries -- and only touched on the final suppression of the Cathars in the late thirteenth and early fourteenth. 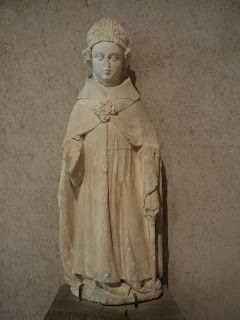 So The Friar deepens our understanding of the spiritual and material milieux in which Inquisitors, Cathars and Spirituals fought it out to the bitter end, with Bernard as a linchpin of sorts. SOS: Funny you should ask. When living in the countryside for a few years outside of Perpignan (in the Roussillon), we first noticed that after a rainfall it became particularly dangerous to drive the narrow country roads, as there were so many people in the fields and on the shoulder of the roads picking things off the ground. We soon realized that it was snails. The Catalans there love a cargolade, snails roasted over dried vine cuttings (sarments), then dipped in various aiolli and romesco sauces. As we became integrated in the rural community, we had many a cargolade with our farmer neighbors. Delicious... So much so that we decided to do one ourselves for all the neighbors. So after it rained one spring day, my young daughters and I dashed out into the surrounding fields and collected perhaps 500 snails. We put them in an enormous basin, added a sprinkling of flour (so that they could eat and purge themselves over a two or three day period). We punched minuscule airholes on the sides of the basin and covered the top with tiles so that none could escape. We went to bed, content with our labors. The next morning we went outside to see how our charges were doing. One of the heavy tiles was slightly askew. Puzzled we leaned over, lifted the tile up. No snails. There had been a massive jailbreak!! Not only that, but to budge that tile must have taken dozens of snails putting their shoulder (or shells) to the task, simultaneously. We stood there, awed. And then decided that maybe we should stick to sardinades. SOS: This is VERY trite, but it is also very true. When I first walked the streets of Paris, on that very first day at the age of 25, I realized that the city would play a very large role in my personal, cultural and intellectual life. And it has. SOS: Headstones engraved with the Star of David in German World War One cemeteries along the Western Front. That these men gave their lives for a country that would turn on and destroy their descendants barely two decades' later... The sight was profoundly affecting and sad... perhaps the saddest gravestones I've ever seen. SOS: Don't want to sound flip here, but I believe it to be the absence of unhappiness, and that it is best attained by working at something you love. It doesn't come from others -- they just amplify it.